For anyone still following this mod... I thank you for your patience! For those of you sticking around for an update... the mod is dead. I have none of the original source code on my computer and I’m sorry to have to say it. Probably not. I’ll sit at my dev space today and think but most likely no banana. The keen eyed followers of my mod may have noticed I stopped churning out updates. Well real life has to take precedence I'm afraid and as I study full time and work two part time jobs, I'm already spread quite thin as it is. That being said; I've been working relentlessly behind the scenes in my Dev environment to hone my skills and learn new techniques and methods to help improve not only this mod, but potentially any others I conjure up in the future. Whilst I understand not everybody will want to offer suggestions for fear of being shot down in flames or simply ignored... please know I always appreciate suggestions and feedback and would love to hear your thoughts on my work! This is as much your mod as it is mine afterall... I may do all the "boring" work, but you are the reason I do it! Anyway... that's my life covered... how about some more relevant news? Whilst I'm not currently able to work on the mod as actively as I would like... please know that the mod hasn't died in Alpha! I'm just overwhelmed with so many ideas I want to implement that I'm trying to self teach everything I didn't know about Forge and modding when I started this mod back in 1.8.9. That being said... my original vision for 2.0 may have to change slightly. I wanted to completely mix things up with 2.0 and try to get back to my magic system that never really took off due to my inexperience at the time. I'm considering dropping everything in 2.0 so far in favour of a more or less total rewrite from the ground up. This will mean a major delay between updates as I'll be literally working from square one... but my hope is by doing this I'll be able to hone the magic system first and introduce the plants later. Because of this seemingly radical decision... I may just cut out 2.0 and go all the way back to basics releasing from 0.0.1 all the way up until I find what I can justify as a 1.0 worthy build. Thoughts welcome below as always! Have a great day! 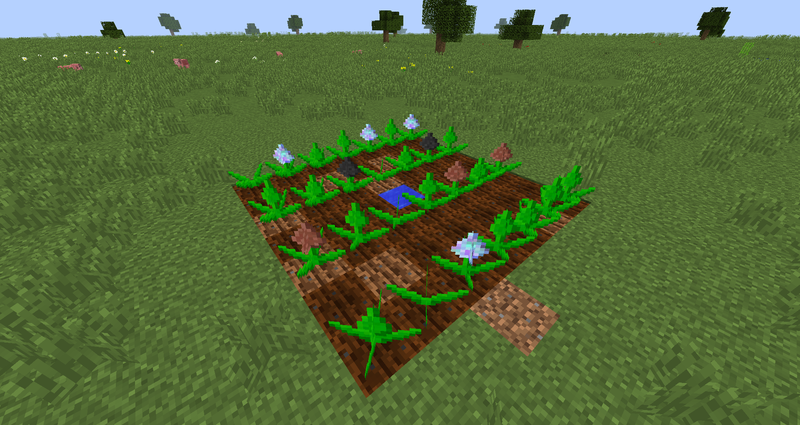 I see people trying to replace magical crops, two or three others besides yourself, why doesn't anyone just port it? Surely that would be easier than just trying to make a new mod from scratch. Simple reason my friend. Doesn’t belong to us. Mod isn’t open source and never has been. Therefore we make alternatives with our own code and textures. That answer that? Began work on version 2 of Mystical Crops. I will be changing a LOT of mechanics in this version in an effort to reduce file size and promote a different gameplay style. These changes may seem drastic, but I wish to tweak the gameplay mechanics and head in a direction that once again uses the Elements left out since 1.8.9. At this stage, I have omitted Vintus and Aqeuous. Version 1.9 of Mystical Crops will see the very early additions of the long overdue and kind of anticipated (lol!) Skyblock mode! It will be deactivated by default however. Just check the config! With Skyblock mode comes some major balancing issues. A lot of mob drops are already available via the mod normally for example. With that in mind, I am adding in crops to create spawn eggs of various passive and hostile mobs. This is of course solely intended for Skyblock mode and will serve as a way to populate your farms initially. In terms of balancing this crop, I can't think of a way to stop players using them solely to avoid passive/hostile mob farming altogether. Any suggestions would be appreciated! Taking player preference and server owner preferences into consideration, I added a config option to disable the soil block if so desired. This is to encourage more vanilla focused farms and will be enabled by default. However you can now remove it entirely from the game so if that's your thing, enjoy! Well that's 1.9 out of the way... onto the future! As you can probably guess... moving into version 1.9 means we are potentially coming up to a total rewrite time once more. Whilst I don't feel that the mod needs to be completely rewritten from scratch, the addition of Skyblock mode brings with it a giant problem. I'm not sure if any of you know, but the mod for 1.9 and up is written, tested, and compiled against Forge for Minecraft 1.9.4. Because of this, it instantly works in 1.10 builds no problem. The addition of Mob plants in Skyblock could prove the death of updates for 1.9.4. As 1.10 added more mobs to the game, version 1.9 of the mod will probably be unsupported once the transition is made to 2.0 as I will be building the mod against Forge for 1.10 only to include the new mobs as plants. I will of course make every conceivable effort to leave 1.9 in as stable a state as I can manage before closing the lid on it for good. 2.0 will most likely see re-textures and some re-balancing of mod mechanics. With the sad news that abusedmaster is stepping down as the author of Primordial Crops, one of the mods with the most potential to be the next Magical Crops has been lost. I intend therefore to get in touch with abused to see if I can integrate his mechanics into Mystical Crops and possibly see if there are any Magical Crops features that could be added to enhance the gameplay. I of course do not intend to re-write Magical Crops. My mod is and always will be an alternative aimed more at easy mechanics and vanilla type progression. I do however wish to start work on the magic system of the mod that was lost back in 1.8.9 so balancing of the mod will be reworked around that as the system gets more in-depth. Feel free to PM me if you're interested. In future, please go to the Project Site by following the link and submitting an Issue there please. I rarely check comments here and don't get notified of comments on the Curse page. I am uploading a pre-release build of v1.9.0. This build includes your bug fix. Reimplemented the alternative seed recipes for coal when ProgAuto or AA is loaded. I lost a lot of work due to a desynch issue with GitHub so small tweaks like that were just missed by me. They have been reimplemented now as of 1.7.5. 1.7.5 will be the last 1.7 build version of Mystical Crops. I am going to begin work on 1.8 which will integrate with Mekanism for resources. That's where I wish to reach out to you; the Mystical Crops community! Which Mekanism resources would you like to be made growable? My intention is and always has been to simply take away one "chore" of resource gathering in Minecraft. Bearing that ideal in mind, I will NOT add in plants for any gases or liquids added by Mekanism so please do not ask me to do so. I'm also aware of the quintupling ore processing method available in Mekanism and will probably change gem conversion to return the ore itself instead of an ingot so as to promote the use of ore processing systems in Mekanism and IC2 respectively. If you are concerned that this will affect vanilla-friendly users, fear not. I would do as I always do and only activate the alternative recipes upon finding the relevant mods in the instance leaving all existing recipes intact otherwise. Another mod I wish to add integration with will be TiCon but I would like to leave that until after Mekanism has been dealt with. GO TO ISSUES TO REPORT ANY AND ALL BUGS!!! THE COMMENTS SECTION IS NOT AN ISSUE TRACKER!!! ANY FUTURE BUG REPORT COMMENTS POSTED DOWN HERE WILL BE IGNORED!!! YOU HAVE BEEN WARNED!!! Sorry about that guys... but I had to get that off my chest! 1.7.2 is available now. Enjoy! You think so huh? Sorry you feel that way. I simply made an alternative for latest versions. If you don't like it... don't use it. Simple. I've uploaded a pre-release of Beta 1.3 to fix an issue with TiC. This build includes some WIP items and blocks that may be untextured at this point, but I wanted to ensure this was fixed ASAP. For stability, please use 1.2.2. If you require the fix for TiC, grab the pre-release. How do I get mystical ingots/nuggets?? Good afternoon Devilmixer and thank you for the report. Your first issue is a simplistic one. You need to make Mystic dust and smelt it in a furnace. Mystic dust is made using an iron and gold dust of any ore dictionaried type. As to the issue with Tinker's Construct. They register their metals as both ore dictionary items and as part of a tool material system unique to that mod. Could you please elaborate if possible or send me an image of the problem? Is the manyullyn forming in the smeltery as a fluid, or forming my ingot when cast into an ingot cast? After some testing on my own with Tinkers, I can confirm this. I have some ideas as to how this can be addressed and I'll work on a fix for it ASAP. I have fixed the problem. Now the smeltery should give TiC preference for its ore dict ingots. A pre-release of Beta 1.3 is uploading now to Curse and includes the fix. This build includes some WIP items and a block for an Alchemical Duster that isn't fully implemented yet, but I wanted to push the fix ASAP for you.